It’s the Easter holiday in the UK and I’ve suffered a bout of spring-clean fever. It is time, I decided, to clear out a mountain of old books and magazines. A job like this always prompts reflections, the first of which is the sad decline of print journalism in the field of software development. It hurt to send piles of Byte, Exe, Dr Dobbs’s Journal, Application Development Advisor and others off for recycling. Before Delphi, you always had to make a choice. Do I go for the performance of a native code compiler, or the ease of use of a visual development environment? Do I go for a powerful object-oriented language, or a proprietary 4GL client/server tool? What programmers really want is all of the above, in one package. That’s what we set out to do. 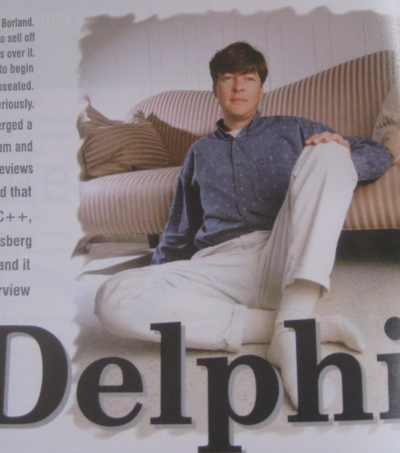 What is striking about Delphi is that this was not hype. It delivered on that promise. It was better than its obvious rival, Microsoft’s Visual Basic, in almost every way (I will give VB a point for sheer ubiquity, especially in VBA guise). Delphi is still with us today, not bad after fifteen years. However, it never came close to VB’s market share, which shows that quality has never been the sole or even the most important determinant of sales success. 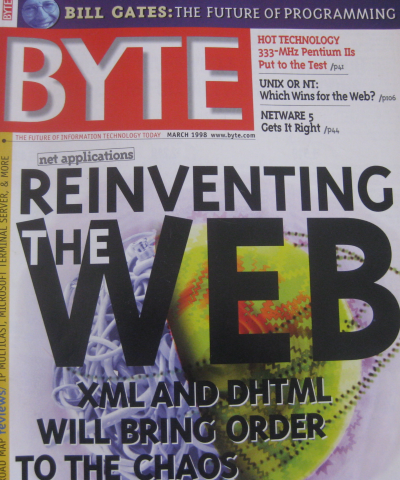 Next up is Byte, March 1998. 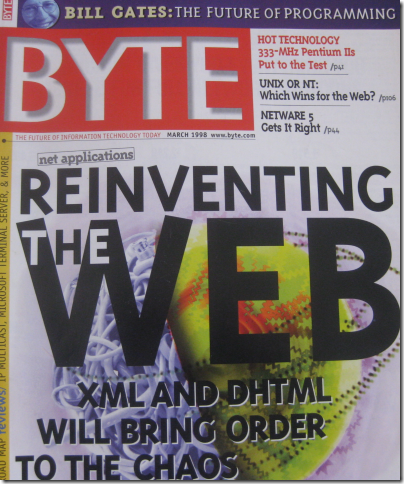 “Reinventing the Web”, the cover proclaims. “XML and DHTML will bring order to the chaos”. HTML, this so-called ‘hypertext markup language,’ implements just a tiny amount of the functionality that has historically been associated with the concept of hypertext systems. Only the simplest form of linking is supported – unidirectional links to hard-coded locations. This is a far cry from the systems that were built and proven during the 1970s and 1980s. Here’s one thing that mostly did not work out as planned. The W3C tried to retire HTML, failed, and is now belatedly engaged in specifying HTML 5. Byte March 1997 is also intriguing. Netscape’s Marc Andreessen smiles out of the cover. Netscape’s Constellation takes a less Windows-centric approach and puts more emphasis on location-independent computing, regardless of the platform. No matter what kind of system you’re using or where you are, Constellation presents a universal desktop called the Homeport. Although the Homeport can appear in a browser window, Netscape usually demonstrates it as a full-screen layer that buries the native OS – certainly one reason Microsoft is not embracing Constellation. 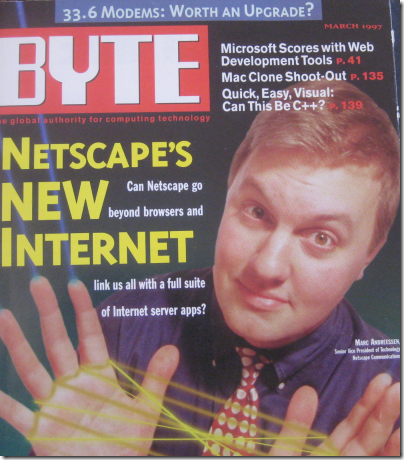 Netscape got a lot of things right, a true pioneer of what we now call cloud computing. What went wrong? Well, Microsoft went all-out to conquer Netscape by removing its browser dominance. Microsoft’s weapon was the free Internet Explorer. It is all a pre-echo of what is happening now with Google and Microsoft, the difference being that Google has huge financial power thanks to its marriage of internet search and internet advertising. Unlike Netscape, Google is winning. This blog is long enough; but I’ll give a brief mention to another jewel from the archives: a book given out at PDC 2003 entitled Introducing Longhorn for Developers. 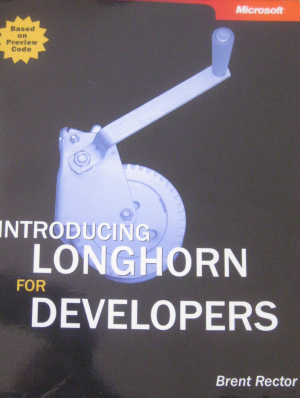 It describes Microsoft’s vision for Longhorn: a radical new application model for Windows, building on XAML, WinFS and “Indigo”, the communication framework. It bears little resemblance to what eventually appeared as Vista, which is a shame as it was compelling in many ways. I often wonder what would have happened if Java hadn’t been invented. I reckon Borland wouldn’t have been so distracted and would gave marketed Delphi better. 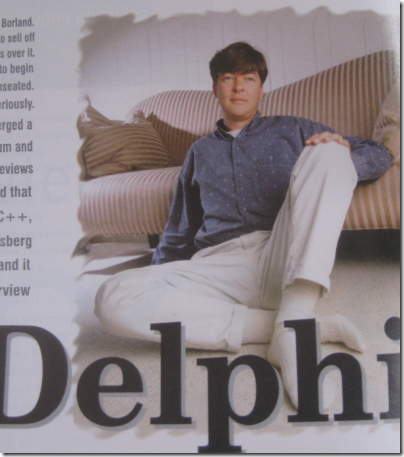 They spent too much effort on Java and JBuilder at a time when corporates were crying out for more effort on Delphi. @John I believe you are correct in that Delphi profits were used to subsidise JBuilder development. What might have happened had priorities been different is open to speculation! That BYTE cover is interesting. UNIX or NT on the web, that question is still to be answered. And NETWARE 5! Where are they now? I had forgotten the strange photos Borland PR sent us of ‘the young Anders Hejlsberg’. Why was he lolling on the floor? Surely old enough to sit on the sofa behind him? If your collection went back as far as 1990 you might even have pulled out the quote where Will says that GUIs are merely a passing fad (sorry, Will).